A short walk from there took us to the Harbour park area where we had some milkshakes and let the zerglings run amok. As well as the standard slides and climbing frames there was a cool interactive water flow system where the channels could be changed all the way through it. Various pumps and gates meant lots of activity (huzzah!) with minimal parental involvement (double huzzah!). So rested we then had a wander round the Chinese Garden of Friendship, a tranquil space in the middle of the city. It was lovely and the kids got to be dressed up in some traditional clothes for us to take pictures of. Zergling 2 was already dressed before we realised this wasn’t actually free so the Tranquil Garden Atmosphere of Friendship almost turned into the Brutal Wasteland of Carnage but it all worked out in the end. 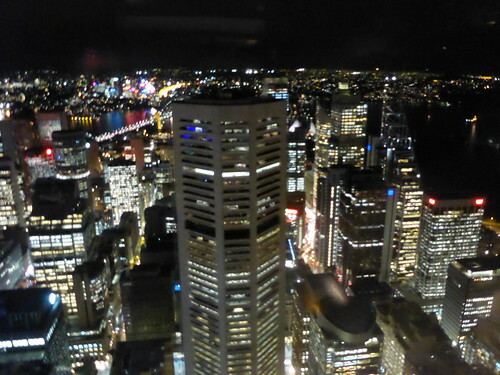 Later in the evening we returned to the Sydney Tower for a night-time meal in the rotating restaurant. I love cities at night and Sydney is a beautiful city; lots of interesting changes between the old and new and variations in colour and texture. The food was nice but very expensive; did get to try kangaroo, crocodile and buffalo (kangaroo tasted the best). Was buffet so didn’t get the chance to recite ‘and make it snappy’ jokes to the waiter unfortunately. Cool walk back through the heart of the city at night then back home to bed.